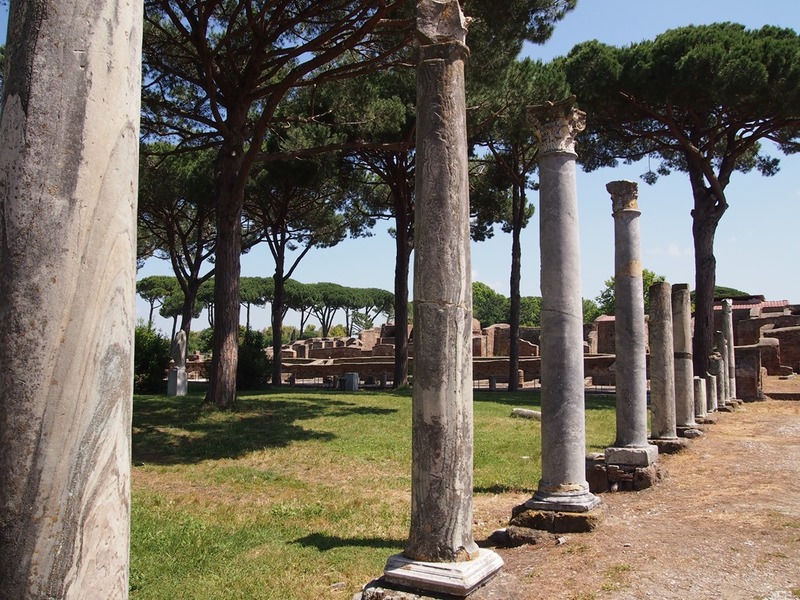 An interesting, easy day trip from Rome is a visit to the ancient port city of Ostia Antica (and possibly Rome’s first colony), now a sprawling set of ruins with buildings in various stages of decay. 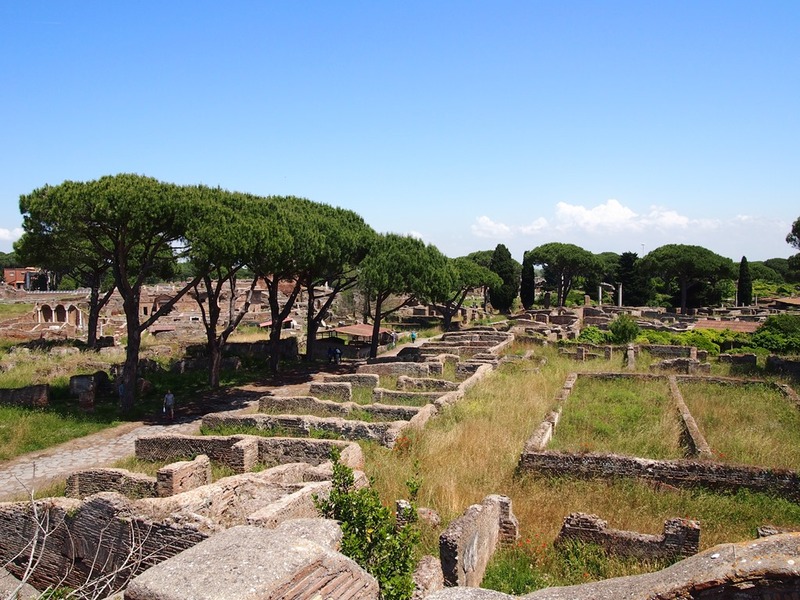 Ostia Antica, as a port city, was an important part of the Roman trading network and had upwards of 50,000 people living within its walls during the height of the Roman empire. At its peak there were said to be 100,000 residents, crammed within its confines. The city used to be at the mouth of the Tiber River – and I say used to be on purpose – because the river changed course and is now more than 3km away. The changing of the river’s location, coupled with the decline and fall of the Roman empire drove the city into a state of neglect, disrepair and abandonment. It’s pretty hard to be a port city once the water disappears. It was a surprisingly easy day trip. The entrance ticket is a reasonable €8 and the site is reached by train from Rome – you take the normal metro to Piramide station and then hop onto a commuter train which brings you towards the coast. There are few of the trappings of tourism – one reasonably priced bar outside the train station and a pizzeria closer to the site entrance. That’s it. No touts, no one following you… it was strangely peaceful. I had an amazing day at Pompeii, through a combination of the ruins and the great people that I met. 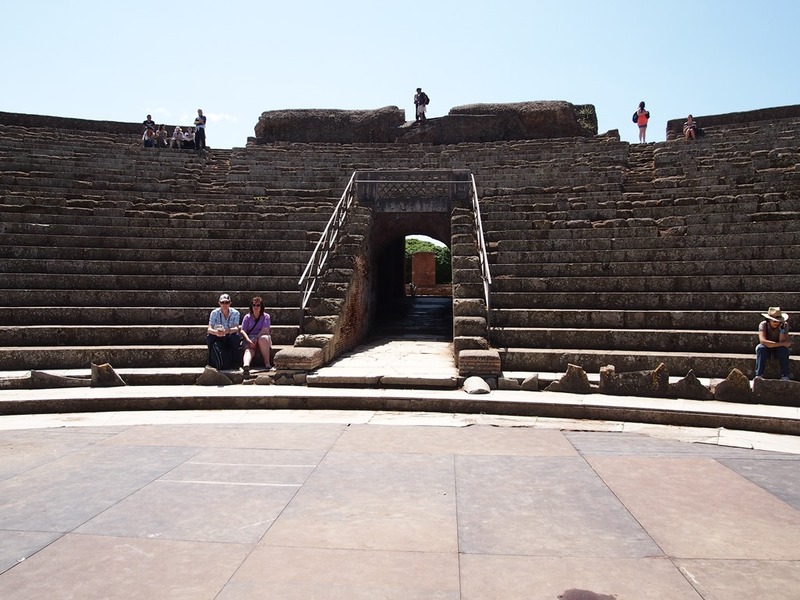 Ostia Antica was a different experience since I roamed alone – and I really felt alone, as there were so few visitors. 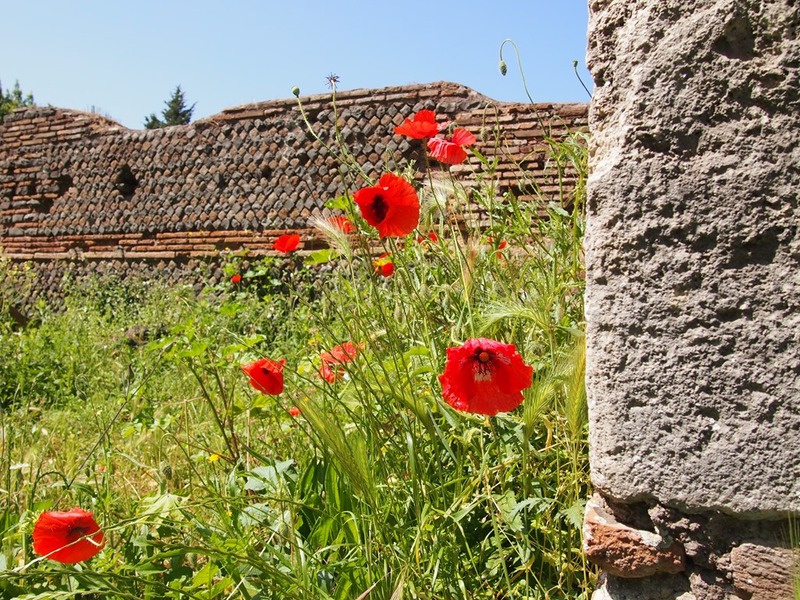 Vegetation grew freely in the ruins, with beautiful poppies and wildflowers sprouting from the untamed grass. I was very glad to be wearing long pants while walking through the grasses and I startled more than one teeny lizard out of hiding. I know that vegetation was one of the causes of Pompeii’s deterioration, but there seemed to be no efforts here to tame nature. There were times when I felt a little bit like Indiana Jones, traipsing through the growth to get a closer look at a grass covered temple or building. There were lots of mosaics, still exposed to the elements, with some of the most detailed and interesting in the square of the guilds. This is where Roman merchants and traders had their offices, with the name of the business spelled out and a pictorial representation of what they did. Fishing related things had fish mosaics, for example, and grain barrels represented grains. There was a mosaic of Neptune that looked interesting, but it was unfortunately covered by a gigantic tarp for unspecified maintenance reasons. 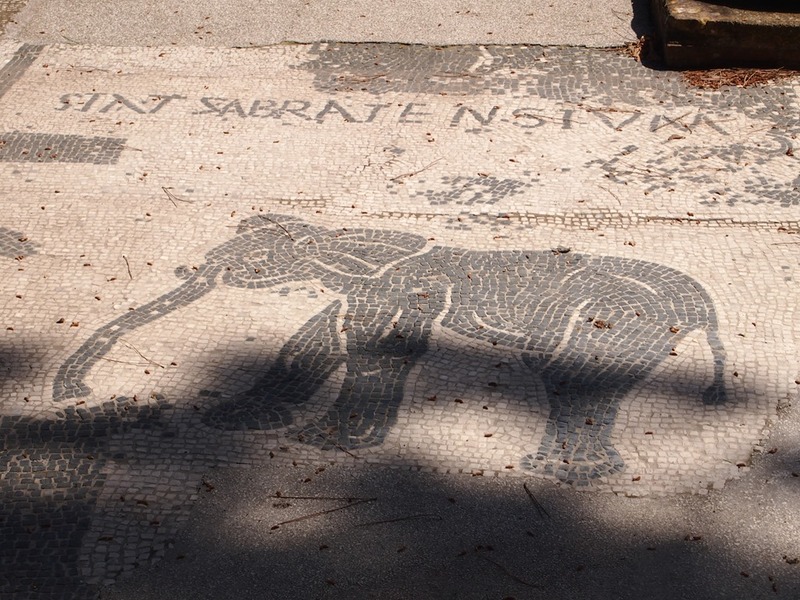 Unlike Pompeii, however, the mosaics were mostly on the floor. I didn’t see any on a wall, although I may have missed them – the site was pretty maze like, so it would be impossible to see absolutely everything. The signage wasn’t the best, but visitors are encouraged to explore with dirt paths worn through the grass. 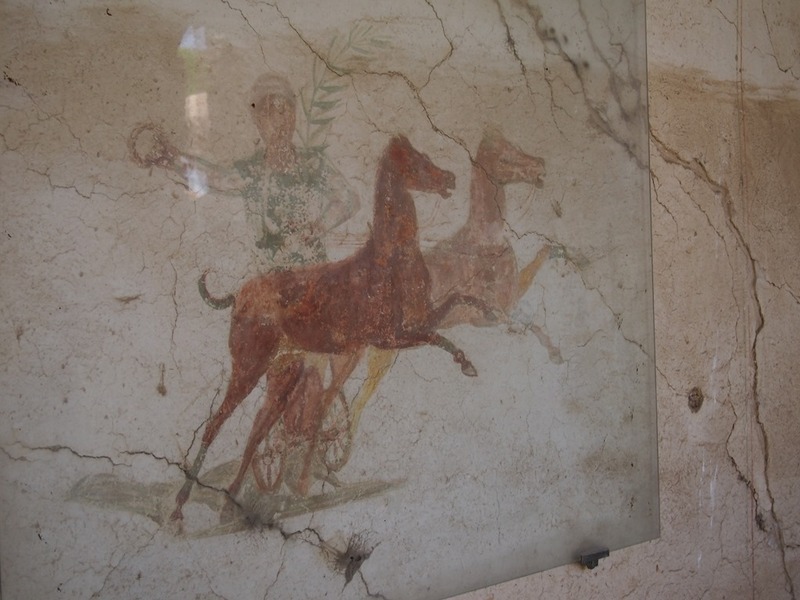 Also they seemed to have learned from Pompeii, roofing over many of the frescos to protect the colours, so anytime I saw a roof and headed into the undergrowth, the venture was generally rewarded. There were many second stories which survived and the site authorities have taken advantage of this by creating scenic overlooks. The short, steep climbs were rewarded by views of the ruins, stretching in both directions. These overlooks didn’t have signs, but reinforced stairs and a lack of gate generally meant that you were free to climb up. I was following a Rick Steves audio guide (seriously, Rick Steves audio guides are worth the time and minimal effort to download) and he directed me up some stairs in an old apartment building. It’s hard to imagine, but the Romans had apartment buildings that could reach as high as 10 stories, although the average was apparently only five stories. There was a small museum, containing the best examples of statuary and funeral sarcophagi that have been found at the site. It was located right beside a bookstore (which had wi-fi, randomly enough) and a small, busy cafeteria. These were the only trappings of commercialism on the site. While I browsed the bookstore I noted that this seemed to be the only store in Rome without Pope paraphernalia… until I made it to the last display case, where Pope Frances was staring up at me. So close! Before coming to Rome I had thought that the gleaming marble buildings were made solely of marble. This was perhaps a naive thought, one quickly dispelled upon arriving in Italy, but marble was simply attached to the brick and concrete buildings as a decorative touch. 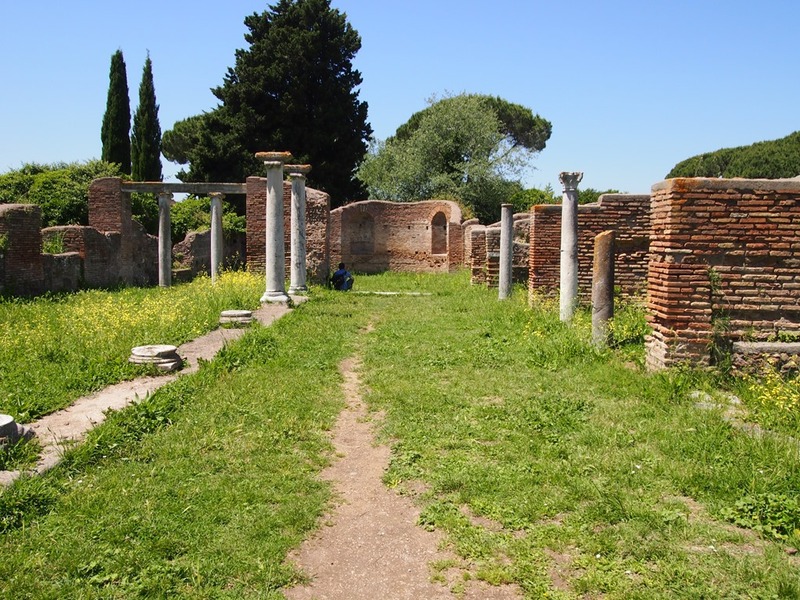 Most of the marble was taken from Ostia Antica during the Middle Ages, but there were still a few areas where it clung to the walls. It wasn’t possible to book a tour at the site, but I did see a few people wandering around with private guides. One of them seemed to be contradicting the information on the plaques scattered throughout the site, so I can’t help but wonder about the truth. Who was lying – the guide, or the plaques? He seemed to be rushing his group through the buildings, so maybe he didn’t want them to verify his statements. Shady business, that… especially since this is another site where I think a private guide would beneficial. Incomplete signage contained very challenging English translations, there was a €2 charge for a site map (which I refused to buy on principle) and unlike Pompeii, there was no little guide booklet available with your entrance ticket. I had downloaded (or at least I thought I did) a rather fantastic guide from http://www.ostia-antica.org but I somehow messed it up and needed to save the pages on my iPhone when I was in the wi-fi enabled bookstore. Finally, I need to finish with an important photo: the 20 seat toilet. Complete with marble seats, a cooling touch on a hot summer day, and a hole at the bottom so that you could clean yourself with a wet, reusable sponge on a stick. Apparently there is no word for privacy in the Italian language – and this communal toilet proves as much!